Learn how Mirth’s HIE solution can support your growth, ease data sharing, and help you reach your goals. In this case study, you'll learn why the Chesapeake Regional Information System for our Patients (CRISP) moved to Mirth® solutions. CRISP has "been there and done that." so here's an opportunity to learn from their experience. Hear about the journey from a colleague's perspective. 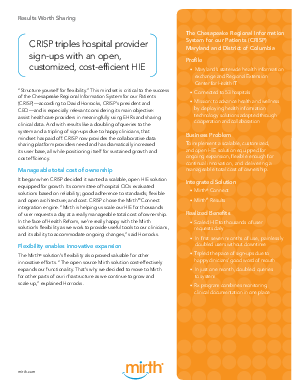 Read "CRISP triples hospital provider signups with an open, customized, cost-efficient HIE."